EIGHT DAYS: June 24 - July 3 9:00 AM-12:00 PM TUITION: $350 Open to boys and girls entering Grades 6 and 7 Get in gear with this exciting academic enrichment program designed to help mid... view details. FOUR WEEKS: June 17 - July 12 (No class on July 4)9:00 AM-2:00 PM Register byFriday, March 15 and receive a $100 discount on the Summer Academy! TUITION: By 3/14 - $1225 - After 3/14 - $1325 ... view details. TWO WEEKS: June 17 - June 28 2:30-5:30 PM TUITION: $395 Open to girls and boys entering grade 8 This course is designed to prepare students entering grade eight for the various high school scholar... view details. TWO WEEKS: June 24 - July 12 12:00-2:00 PM TUITION: $435 Open to girls and boys entering grade 9 This course offers a review of pre-algebra concepts and skills and the initial concepts taught in A... view details. 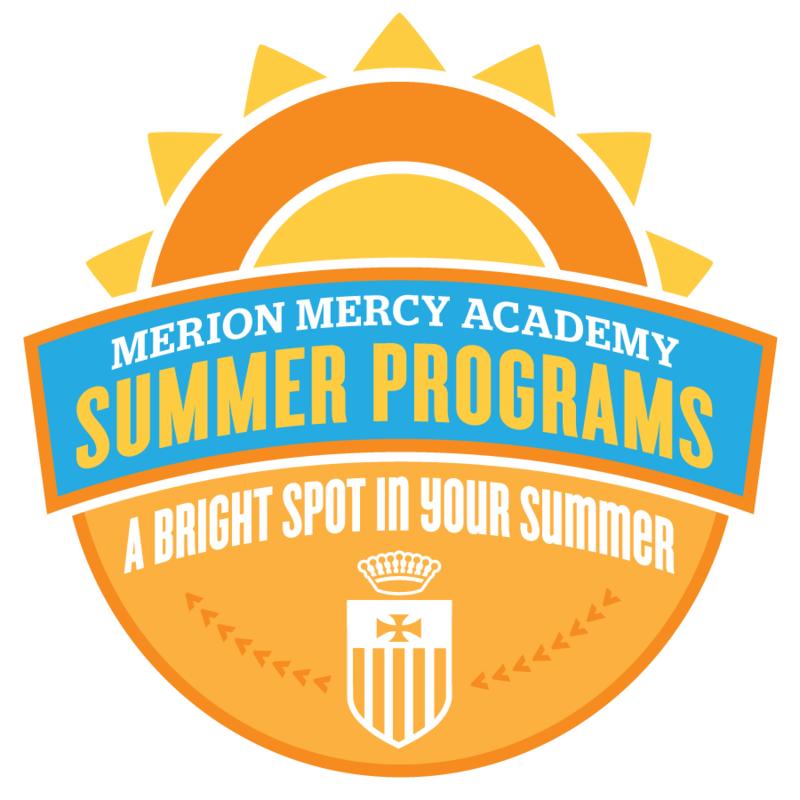 TWO WEEKS: June 24-July 26 TUITION: $400 (Non-credit) Open to Merion Mercy Students entering Grade 9 This course is designed for students who are unable to attend MMA’s summer program and wo... view details. THREE WEEKS: June 24-July 12 (No class July 4) 12:00-2:00 PM TUITION: $440 (Non-credit) Open to girls and boys entering grades 9-10 This course provides a good review of Algebra 1 concepts. Stude... view details. ONE WEEK - June 24- 28 9:00 - 11:00 a.m. TUITION: $165 (Non-credit) Open to girls and boys entering grade 9 This course will establish the fundamentals of English speech and grammar as it r... view details. TWO WEEK - June 17 - June 28 TUITION: $165 (Non-credit) Open to girls and boys entering grade 9 This course will establish the fundamentals of Englishspeech and grammar as it relates t... view details. June 24 - July 12 $225 OPEN TO MERION MERCY STUDENTS ENTERING GRADE 9 Students may register for this class only after approval from the academic office. Science Readiness is designed to be a... view details. THREE WEEKS - June 24 - July 12 (No class July 4) 9:00-11:00 AM TUITION: $455 (Non-credit) Open to girls and boys entering grade 9 This class challenges each student to develop a plan... view details. THREE WEEKS - June 24 - July 12 (No class July 4) 9:00-11:00 AM TUITION: $440 (Non-credit) Open to girls and boys entering grade 9 Writing Workshop is offered to students who wish to ... view details. THREE WEEKS - June 24 - July 12 (No class July 4) 12:00-2:00 PM TUITION: $440 (Non-credit) Open to girls and boys entering grade 9 Writing Workshop is offered to students who wish to ... view details. THREE WEEKS - June 17 - July 5 (No class July 4) TUITION: $500 (One-half credit) Open to girls and boys entering grades 10-12 This course presents topics of probability including basic probability... view details. THREE WEEKS - July 8 - July 26 TUITION: $500 (One-half credit) Open to girls and boys entering grades 10-12 This course presents the concepts of Euclidean geometry and the relationship ... view details. FIVE WEEKS - June 10 - July 12 (No class July 4) 8:30 AM - 12:30 PM TUITION: $890 (One-credit) Open to girls and boys entering grades 9-12 The core concepts of Biology will be covered... view details. SIX WEEKS - June 17 - July 19 (No class July 4) 8:30 AM - 12:30 PM TUITION: $890 (One-credit) Open to girls and boys entering grades 10-12 In this course, emphasis is placed on quanti... view details. FIVE WEEKS (Tuesday, Wednesday and Thursday) June 11- July 11 (No class July 4) 8:30 AM - 12:00 PM TUITION: $570 (One-half credit) Open to girls and boys entering grades 10-12 This course... view details. THREE DAYS June 17- June 19 9:00 AM - 12:00 PM TUITION: $195 plus a $95 book and material fee paid to the instructor the first day of class. ** Open to girls and boys entering grades 10-12 ... view details. THREE DAYS June 24- June 26 9:00 AM - 12:00 PM TUITION: $195 plus a $85 book and material fee paid to the instructor the first day of class. ** Open to girls and boys entering grades 10-12 ... view details. ONE WEEK: June 24-28 12:30-2:30 PM TUITION: $170 (Cost of class includes all materials) Open to girls and boys entering grades 6-9 Explore your creative side in our NEW art and design center durin... view details. ONE WEEK: June 17- - June 21 12:30 - 2:30 PM TUITION: $150 Open to girls and boys entering grades 6-9 Program a robot, make light displays or design a game!Learn the basics of computer coding... view details. THREE DAYS - July 1 - July 3 12:30-2:30 PM TUITION: $110 Open to girls and boys entering grades 6-8 We will solve a mystery this week! Use your powers of observation and the Scientific Metho... view details. FOUR DAYS: July 15- July 18 2:30-5:00 PMTUITION: $150This field hockey clinic will focus on the fundamentals of the game such as basic stick work, field positions and rules of the game. S... view details. FOUR DAYS: June 24 - June 27 2:30-5:00 PMTUITION: $150 Field hockey is becoming increasingly more popular in the early grades. This clinic will focus on the basic fundamentals of the gam... view details. ONE WEEK: Monday - Thursday, July 8-11 2:30-5:00 PM TUITION: $150 Open to girls entering grades 6-9 This basketball clinic will focus on skill development (dribbling, shooting and passing) a... view details. ONE WEEK: Monday - Thursday, August 5-8 4:00-6:30 PM TUITION: $150 Open to girls entering grades 6-10 Led by Merion Mercy’s varsity volleyball coach, this clinic will help you to learn the b... view details. FIVE WEEKS: June 17 - July 19 TUITION: $350 (One-half credit) Open to Merion Mercy students only - Pre-11th and Pre-12th grades Fulfills one semester social studies credit requirement for graduati... view details. FIVE WEEKS: June 17 - July 19 TUITION: $350 (One-half credit) Open to Merion Mercy students only - Pre-10th, Pre-11th and Pre-12th grades Fulfills one semester of science credit requirment for gra... view details. FIVE WEEKS: June 17 - July 19 TUITION: $350 (One-half credit) Open to Merion Mercy students only - Pre-10th, Pre-11th and Pre-12th grades In this ½ credit course, students will study the vi... view details. FIVE WEEKS: June 17 - July 19 TUITION: $350 (One-half credit) Open to Merion Mercy students only - Pre-10th, Pre-11th and Pre-12th grades Fulfills one semester Science credit requirement for gradu... view details. FIVE WEEKS: June 17 - July 19 TUITION: $350 (One-half credit) Open to Merion Mercy students only - Pre-11th and Pre-12th grades Fulfills one semester of social studies credit requirement for... view details. FIVE WEEKS: June 17 - July 19 TUITION: $350 (One-half credit) Open to Merion Mercy students only - Pre-10th, Pre-11th and Pre-12th grades In this ½ credit course, the components of fi... view details. FIVE WEEKS: June 17 - July 19 TUITION: $350 (One-half credit) Open to Merion Mercy students only - Pre-10th, Pre-11th and Pre-12th grades Flfills one semester Social Studies credit req... view details. FIVE WEEKS: June 17 - July 19 TUITION: $350 (One-half credit) Open to Merion Mercy students only - Pre-10th, Pre-11th and Pre-12th grades In this ½ credit course, students will learn ... view details. FIVE WEEKS: June 17 - July 19 TUITION: $350 (One-half credit) Open to Merion Mercy students only - Pre-11th and Pre-12th grades Fulfills one semester Social Studies credit reuirement for graduatio... view details. FIVE WEEKS: June 17- July 19 TUITION: $350 (One-half credit) Open to Merion Mercy students only - Pre-10th, Pre-11th and Pre-12th grades In this ½ credit course, students will study music i... view details. FIVE WEEKS: June 17 - July 19 TUITION: $350 (One-half credit) Open to Merion Mercy students only - Pre-10th, Pre-11th and Pre-12th grades. Fulfills one semester Social Studies credit requiremnt fo... view details.